It’s that time again, time for me to seek out a new dentist. I figured that since many dental professionals are interested to know what patients really look for in a dental clinic, I’d try a new tactic. As a dental patient myself, I am going to offer a few things that patients like me look for when seeking out a new or their first dental clinic. It’s important to understand that there are things you cannot change, such as the location of your clinic (unless you have more than one) and I’ll be completely honest, I’m leaving my dentist due to location issues. I live at least twenty-five minutes away from my dentist and that can be a pain when it comes to scheduling appointments that coincide with my work schedule. It is also important to understand a fundamental truth about your patients: most do not have weekdays from 8 in the morning to 5 at night off. A lot (though not all) have full-time day jobs. This brings me to the first crucial thing new patients, like me, are looking for. Something to keep in mind is a full-time day job does not mean eight hours and done. As you might already know if you work a fair distance from where you live, a full-time day job starts when you get up in the morning to the moment you walk through your front door. For example, I leave my house at 6:45 AM and return home at about 5:30 PM. That is my full-time day job. So when it comes to considering my options for a dental clinic, I have to consider the hours of operation and if there is any wiggle room when it comes to my own work schedule. If the hours of operation are the same as those for a bank or government building, I will look elsewhere. Are you open later on certain days? If not, are you open at least one day out of the weekend? After learning about the hours of operation, I’m inclined to see the dental clinic for myself, which means I will schedule my first appointment as a test run. And the next thing I look for changes my entire perspective on whether or not I stay. The front staff is a clinic’s very first impression. I have gone to dental clinics where no one was at the front desk, or where the front staff was arguing, or where the front receptionist/Office Manager was frowning down at their keyboard as though it had just insulted them. This breeds a negative atmosphere that can be felt by new and existing patients. Think of this as the audition process. What impression do you want to make on new patients just walking through the door? It doesn’t take much to turn a new patient off. Pay attention to the atmosphere, the ambiance, and most importantly the very first point of contact at the front desk. The front staff are crucial to whether a patient stays or leaves. They set the mood and the tone by what they do and what they say. I will stay for an upbeat and smiling front staff, a front staff that is going to make me feel comfortable in a place that terrifies me. A positive atmosphere is key in any new patient choosing a dental clinic and is essential to any successful practice. This requires smiling, engaging, and putting the new patient at ease. Very important tip: Never let a patient come into an empty office. This is a huge no-no! Ensure that someone is always there to greet them and begin the introductory process as soon as they step into the office. The next thing I look for in choosing the right dental clinic for me is a combination of traits practiced by the entire team. It’s important to know that all your patients are different in very profound ways, and even though some may have the same fears, they don’t all see or handle those fears the same way. Which is why empathy and understanding are two of the most important tools in your arsenal. I have come across too many dental and health professionals who have either nodded dismissively upon learning my fears or, in one case, rolled their eyes. To say that I felt less like a person and more like a burden was an understatement. Make sure that you don’t just hear your new patient’s fears but actually listen. You need to understand first how dire the situation is, then take a moment to practice empathy. Try to see it from their point of view. And for patients who don’t speak up, be friendly, warm and engaging. Ask questions instead of grilling them. Eventually, they will open up. As an example, a friend of mine went out to look for a dentist a few months ago. He has a sensitive gag reflex same as me and both his former dentists ignored it or told him he was being silly. Finally, he let me know that he finally found the right dentist: “She’s perfect! She even understood about my sensitive gag reflex.” Now he doesn’t go to anyone else. Make sure everyone on your team knows how important the traits of empathy and understanding are to attracting and keeping new patients. It will show in your online reviews, and your word of mouth marketing might even see an uptick. These are the top three things I consider as a new patient on the search for a new dental clinic. Even though all patients are different and these three considerations may not be as high on their list, I guarantee they will be there. 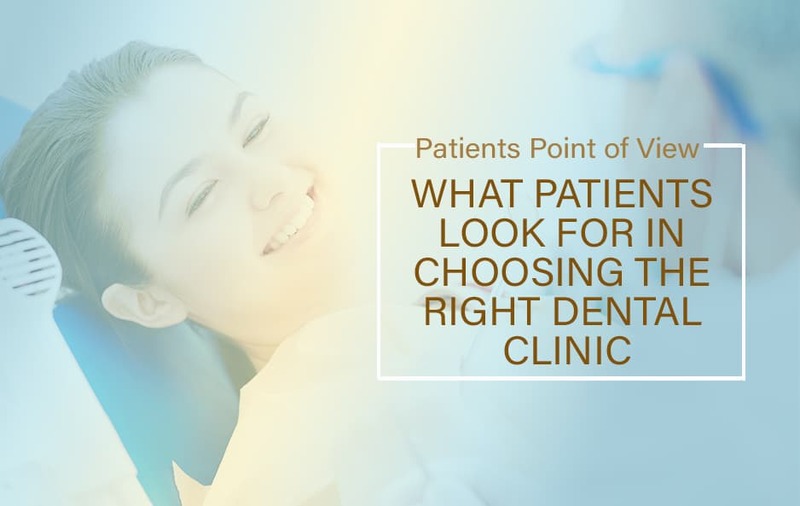 Take a moment right now to consider what you look for in a new dental or medical clinic and compare that to what your clinic currently offers. A new year means being open to new ideas that can significantly increase not only the number of new patients you acquire but patient loyalty with your existing clients.